Imagine your idyllic winter getaway: Trees capped with glistening snow, seemingly endless rolling hills, a steaming cup of hot cocoa in your hands after the end of a long day spent outdoors. If you’re like many others the end of your cold day includes a cozy hot tub nestled among the swooping branches and star-filled sky. You might be longing for that respite getaway where you can essentially melt into the contours of an oversized bathtub, hypnotized by the rhythmic sounds and pulsing jets. Stress evaporates with the steam and the body feels rejuvenated. While it’s easy to recognize the psychological benefits of visiting a hot tub, owning one may be just as beneficial for your health and wellness. The alleviation of stress that you imagined on your getaway, can be enjoyed right in the luxury of your own home. If you’re considering the purchase of a new water spa, keep in mind the following far-reaching advantages that make hot tubs seem more a necessity than a luxury. As one of the oldest forms of naturopathic therapy, hydrotherapy does wonders for arthritis, fibromyalgia, scoliosis and lower back pain. 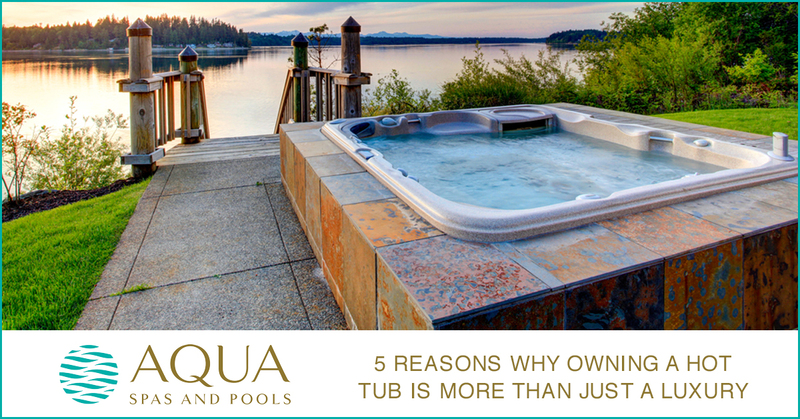 There are numerous reasons why immersing in a hot tub works wonders on your body. When the force of gravity gets reduced the pressure that compresses joints gets reduced as well, alleviating pain. The water also provides a 360-degree cushion for aching joints, improves circulation, and lessens swelling and inflammation. Hot tubs can increase the blood flow, as your core body temperature rises from the hot tub, your body naturally engages a cooling mechanism. This leads some of the blood vessels in your skin to dilate in an attempt to release extra heat. Increases in blood flow has beneficial effects, if you can not exercise this will help get your blood moving. Consequently, nutrient-rich blood flows to your muscles, which in some studies turn reduces glucose levels in people with diabetes. Before self-medicating with whirlpool jets and chlorine, check with your doctor. If you occasionally have difficulty falling asleep. It turns out a soak in a hot tub can help significantly. According to a 1997 study from the New York Hospital– Cornell Medical Center, your body temperature naturally dips in the night approximately two hours before you close your eyes. It then plummets to its coldest point around 4 a.m, or 5 a.m. By soaking in a hot tub for 20 minutes two hours before bedtime, you not only relax more but encourage sleep by forcing your body through the cooling down actions allowing your body to sleep comfortably. Hot tubs are a common tool used for helping people with cerebral palsy, with the aid of the water’s restorative and detoxifying abilities. The water can provide a natural resistance, encourages a wider range of movement, reduce pain that is common with cerebral palsy, and they can also help improve cardiovascular conditioning. As nearly anyone who has stepped foot into a hot tub can attest that it is a relaxing experience. Hot tubs can help to relieve stress related depression and calm nerves. Hot tubs can also be mood elevators and alleviate stress. Pain seems to drift away, your blood pressure drops, and your mind can naturally free itself from your regular day-to-day worries that exist outside of the whirlpool. If you are interested in bettering your health and wellness there are many different benefits that come from a custom installed hot tub. They can be both powerful, yet relaxing, and are engineered to provide pressure to the parts of your body that truly need it. When you’re ready to discover the advantages of owning a spa yourself, contact Aqua Spas and Pools, check us out today.